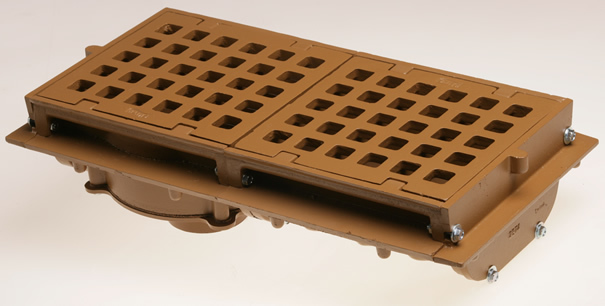 2710 Heavy Duty Modular Trench Drains - Jay R. Smith MFG Co.
Used as a ramp drain in loading or parking areas where a wide continuous trench drain is required to handle moderate traffic loads and serve as a reservoir for large water runoff. Can also be used individually as an area drain. Duco Cast Iron Flanged Body Outlet Section A and Flanged End Plate with Cast Iron Anti-Shift Loose Set Square Hole Grate. Smith No. 2810 series all cast iron 6” wide heavy duty drain of lengths and figure numbers as shown on plans.